As the weather takes a turn from blustery winter to a warmer, friendlier spring, it’s time to hit the bar scene to melt the ice off of your frigid social life. You can say that St Patricks Day is the unofficial time of the year when we ring in the spring season with some cheers. How about participating in some daytime fun to mark the giant St. Patrick’s Day celebration this year? Put on your best green garb and join in the annual St. Paddy’s Luck of the Irish Pub Crawl taking place in the heart of New York City. Come on down to the big city for a fun-filled day with plenty of excitement and drink specials around every corner. Grab yourself a cold one from a host of your favorite bars to commemorate your favorite Saint. With countless neighborhoods to crawl in such as the East Village, Murray Hill, Chelsea, Midtown West, among others you’re bound to find the end of the rainbow on this St Paddy’s pub crawl. There’s no celebration like an NYC holiday celebration. Apart from its famed annual St. Patrick’s Day Parade, you’ll be able to participate in the greatest pub-crawl in the history of bar hopping. St. Paddy’s Day is already known as one of the best holidays to imbibe in. What better way to seal the occasion than a spirited frolic through the best bars in the Big Apple? Before you start your daylong journey, you’ll first meet up at the registration bar that you’ve chosen to start at. There, you’ll meet our friendly event staff. They will gladly get you set up with your St Patricks Day wristband, the full map of venues participating, as well as the list of drink specials that’s sure to keep the good times flowing as you track your course. Get your drink on with the whole crew while taking part in the super festive St Paddy’s party atmosphere. 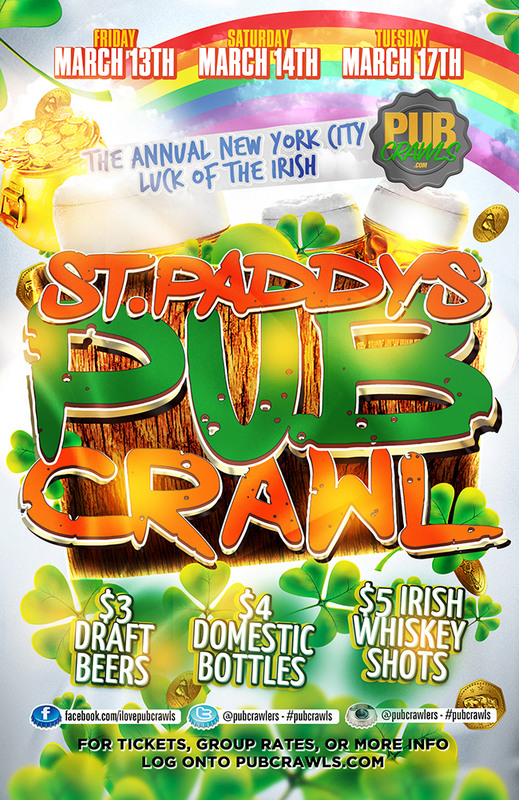 This year, join the biggest daytime party in the Manhattan at the annual St. Paddy’s Day Luck of the Irish Pub Crawl. 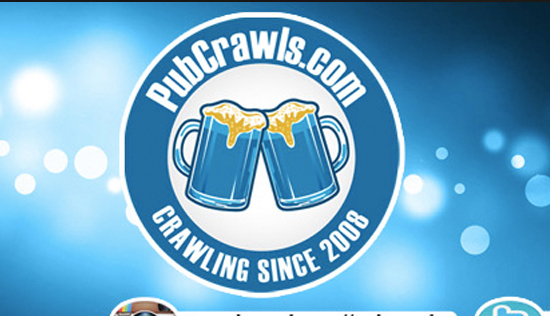 Over 50 bars are participating in this year’s St Paddy’s Day Weekend Pub Crawl including Bar None, Atwood, Raise, Johnny Utah’s, Suite 36, Local 138, Blarney Stone, The Grayson, Bait and Hook, Plug Uglies, and much much more! The Full List of Drink Specials and Bars will be listed on the MAP which will be distributed at registration by PubCrawls.com event staffers.